A National Oceanic and Atmospheric Administration computer system that provides information on currents, water temperature, ice and waves in the Great Lakes has been turned off because of federal government shutdown. A forecasting system that helps Great Lakes weather predictions and would aid in the response to a rupture of the Line 5 oil pipeline is among the casualties of the federal government’s partial shutdown. Computers that feed information into the National Oceanic and Atmospheric Administration’s Great Lakes Coastal Forecasting System have been off since late December, NOAA researchers say. That’s when parts of the federal government were shuttered amid a stalemate over President Donald Trump’s calls for a $5 billion wall along the southern border. The forecasting system — a set of three-dimensional computer models — provides information on currents, water temperature, ice and waves in the Great Lakes. A specific model forecasts conditions in the Straits of Mackinac, the turbulent gateway between Lakes Michigan and Huron. Related: The federal shutdown hit Sleeping Bear Dunes. So volunteers rushed in. That’s where a piece of Enbridge Energy’s Line 5 oil pipeline stretches along 4.5 miles of lakebed. It has never leaked in the Straits over 65-years of operation, but it has attracted widespread scrutiny in recent years after a different Enbridge pipeline spewed more than 1.2 million gallons of crude into the Kalamazoo River. Eric Anderson, an oceanographer in NOAA’s Great Lakes Research Lab, built the forecasting model in 2012. He said it’s crucial for mapping where oil might travel in the Straits during a spill. 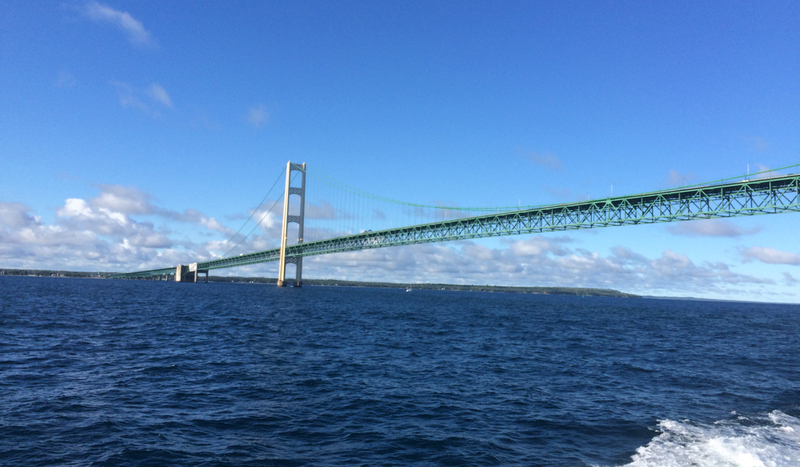 Researchers at University of Michigan and Michigan Technological University are among those who have used the model to map spill scenarios were Line 5 to rupture, an unlikely scenario that could prove catastrophic for the Great Lakes. Worst case forecasts have varied. Michigan Tech, for instance, estimated a spill could reach as many as 437 miles of shoreline along Lakes Michigan and Huron. The NOAA forecasting system would also prove handy after a spill, Anderson said. It would allow the agency to tell the Coast Guard where oil might travel days after an incident. But that forecast will be out of commission until Washington decides to govern again. Anderson said his lab is considered “non-essential,” during the Washington statemate, meaning he and his colleagues are furloughed — and their research is halted — until Trump and Congress reopen the government. That means lake data isn’t feeding weather forecasts, worsening predictions of conditions such as lake-effect snow, Anderson said. Some “essential” NOAA staffers would still work with the U.S. Coast Guard during a spill response, but they would lack up-to-date data to predict where oil would travel after the initial hours of a spill, Anderson said. “It’s important that people understand we’d still be out there cleaning up and doing the response and all, based on what we’d see visually. We’d be actively removing oil from the water,” Edwards said. But Edwards said the data pause might limit the Coast Guard’s ability to “[look] a few days ahead” to where oil might end up — complicating decisions over where to place protective booms. Enbridge downplayed the significance of NOAA’s partial shutdown. “In the unlikely event of an actual incident we would rely on real-time data. We would collect data through air sampling, overflights, field recon and weather monitoring to guide the response team in orchestrating an effective response,” Ryan Duffy, an Enbridge spokesman told Bridge. “The fact that NOAA is temporarily shut down has almost no impact on an oil release response. Enbridge can easily replace the services it provides,” he added. Line 5’s critics are pointing to the forecasting trouble to renew their calls to halt oil through the Straits. I guess that Speaker Pelosi needs to end the vacations that her fellow democrats have been taking and get back to work! I hear that Rep. Lawrence and her colleagues just loved catching some rays on the beach in Puerto Rico and taking in an special performance of "Hamilton" just a few days ago. The Pelosi and The House already voted on and passed a bill that includes $1.5 billion for border security; the exact same bill that passed in the Senate back in December. That bill is sitting on Mitch McConnell's desk and he refuses to put up for a vote, instead he's ceding control of the Senate to Trump. Last time I checked, $5.7-billion was needed. Since a mob tried rushing the border at least twice over the past few weeks, I'd say that The Wall now falls under national defense (an actual function of the federal government). You are well informed. Until the Re-publicans can find a way to use the $1.5 B toward Mexican border security, why throw good money after bad? The "stone-walling" GOP is great at building walls, but clueless about "building bridges."